Disclaimer: In real life, Heinze never gets angry or even annoyed by losing a game. He actually really doesn’t mind if he wins or not, as long as it was a good game. 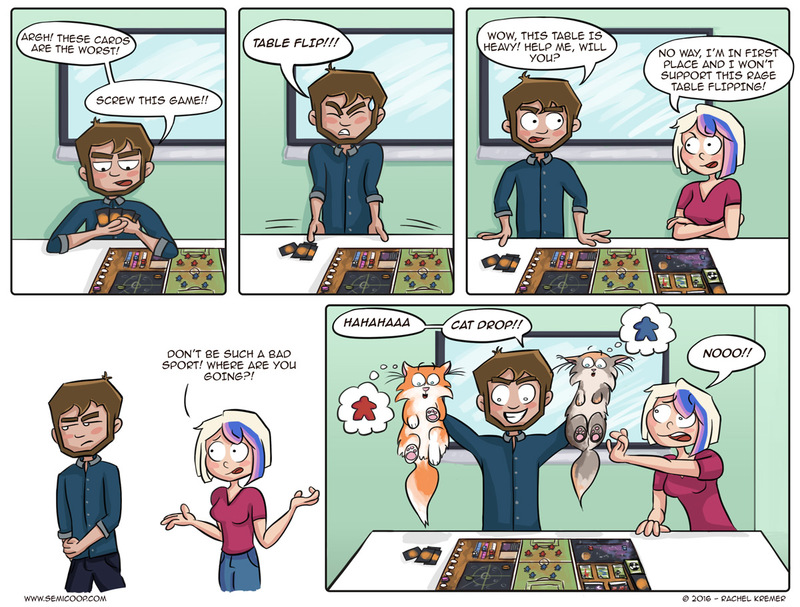 And don’t worry, we don’t drop our cats on the table to sabotage a game either… although they would probably like it. The idea for the comic came from the idea that flipping a table out of anger isn’t as easy as it looks! And well placed cats are just as destructive to a game as a table flip. 😉 We couldn’t really think of a game that angers us enough to ‘rage quit’ a boardgame. So the game you see on the table is a fictional game called “AFC Wimbledon goes to Mars”. What now?! Yes, you can read this comic to find out more if you’re curious. For my readers in the USA – I just saw that Amazon has a lot of amazing board games for sale, you might want to check it out: Amazon’s Tabletop Deals. Note: If you buy a game via that url you actually support Semi Co-op! Have you ever played a game that has made you want to flip a table? If yes, which game? Loving today’s comic! The expressions on the cats say everything! Munchkin…at a convention…with random people…that seem to mostly know each other…in a tournament…for prizes. Hahaha, thanks so much for sharing! A friend’s mum threw their game of Monopoly out of a train window, not because she was losing but because she wasn’t winning by enough. Childhood trauma has stuck with him and he’s not a gamer, no wonder with role models like that! Our cat tried to go Godzilla on our game of Ticket to Ride: Nordic Countries last night. She really loves being up on the table. Ludo, or as its known here: mens erg je niet (of mens erg je wel). the goal of this game is basically annoying your opponent as much as possible. what is the game that is shown here? or anny mean game where you have to or can be meen to a other player (basicly destroying there chance to win). especialy with long games, a 3 hour game, where you can be eliminated in the first 30 min… not my thing, i avoid those games. especialy if the game itself encurages it.